The first automobile designers began their work around 1943. 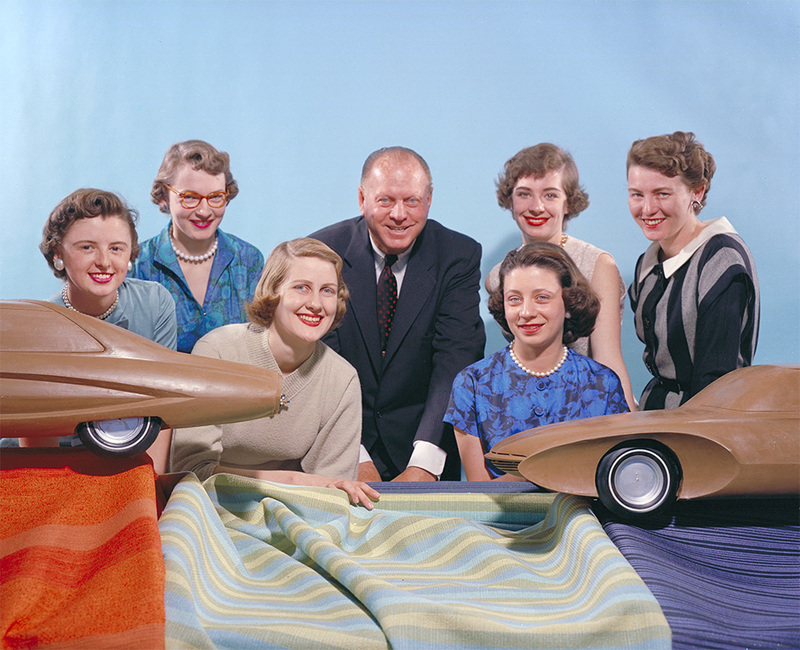 Harley Earl, the first design manager of General Motors and later Vice President of the company, hired those who would be known as “Damsels of Design”. Reluctant pioneers, they were designers marked by their gender and era. Dagmar Arnold, Ruth Glennie, Gere Kavanaugh, Jan Hrebs, Sandra Longyear, Helene Pollins, Peggy Sauer, Jane Van Alstyne, and Suzanne Vanderbilt were the first women in a world of men. Harley Earl believed he saw a new vision in them, excellent attention to details, in addition to a great ad campaign for GM, otherwise he would not have chosen the name “Damsels of Design”. Harley Early retired in 1958. Unfortunately, the policy of hiring female designers at GM did not continue. Despite the short amount of time that these women performed their roles, the limitations and obstacles that they encountered within the company, their contributions to the vehicles from that era were significant. Beyond the colors and materials, they created new devices that improved driving: new controls for windshield wipers that were easier to activate in the dark; they contributed significantly to the introduction of the “six-way seat”, now the front seat could be easily adjusted using electric motors, which increased the driver’s comfort and visibility. Thanks to their work, GM took a different approach to the needs of its drivers. For example, the “Carousel” station wagon (Oldsmobile, 1958): the back part of the front seats was magnetized; that, together with an extendable seatbelt allowed children to entertain themselves, play, and store their toys. Almost the same concept as the modern screens and DVDs in the backseats, if you have a family you know what I mean. Control of the rear windows on the car dashboard and audible warning devices for closing doors were also incorporated for the first time. GM was ahead of its time in hiring female designers. Today, there are few cars designed by women, which is easily explained: there are fewer women than men working in the car world, by extension there are also fewer women designing them. Of the 15 to 18 people that graduate every year from the “Center´s Transportation Design” program, only two or three are women. The same happens at “Art Center for Design” in Pasadena, California, where only one of every ten graduates is a woman. This does not happen in the digital product design world. We have approximately the same number of men and women working in our discipline. Even so, there are more men managing teams and companies than women, but we cannot argue that there are few female designers in our industry. We are not the automobile industry, we do not have that excuse. They are still announcing the speakers for this year and the first two confirmed speakers are women. Beyond their gender, they are great professionals, and that is what it is about, it has always been about that. When UXMAD started as a project and thanks to this small controversy, we proposed the same number of male and female designers. It was never a quota or an obligation, but it was a firm aim to not forget about valid opinions of great designers. Not to raise any flags or cause controversy … but the difference in upper-management positions, the difference in salary, appearing in interviews, presence at conferences between male and female designers exists, it’s real. That is why the visibility of female designers is so important. We need all points of view, all opinions. Not to have many, but to find the valid ones among them, be them from men or women. Aspiring for design to be relevant and transformative in our societies is legitimate, trying to do it from a place of equality is absolutely essential. I must not fail to mention the group Ladies That UX, we can’t give ourselves the luxury of forgetting, not listening to or ignoring our female colleagues. Happy UXSpain.